levels, and includes interactive real-time simulations, animations, illustrations, and quizzing mechanisms within an interactive environment. The SimBioSys™ engine is based on over 240 Differential Equations, and has over 1000 parameters. The underlying models include cardiovascular, circulatory, respiratory, and renal systems coupled to a vascular system and peripheral organs, all of which are coordinated by the central nervous system. 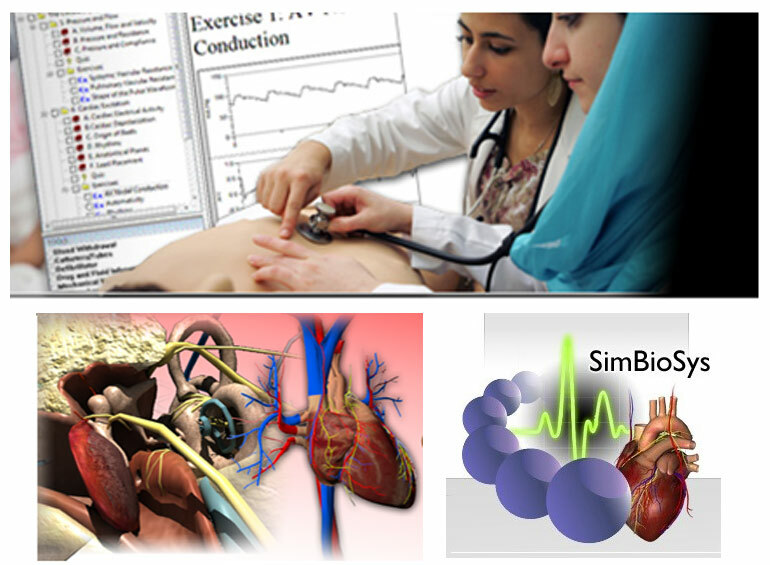 A user can review the current condition of a patient, simulate medical interventions, and assess the cause and effect of the patient’s response to various courses of action. The user can control the rate of blood loss and/or transfusion, respiration/intubation, introduce medical devices (such as pacemakers, defibrillators, ventilators, and catheters) and infuse over 75 different drugs and fluids. The real-time simulation feature provides multi-dimensional feedback, allowing the student to analyze the outcome of medical interventions in real-time, as they occur. Output parameters are calculated several times per millisecond and displayed through commonly used graphs and readouts. All simulations are synchronized, offering a comprehensive and accurate view of patient response. Ex. 2: Determinants Rst. Memb. Pot. Models the way a real patient’s physiology responds to real interventions.